The Jim Johnson people know from the media and all the success he had as a coach is well documented. What follows are my personal recollections of a person who meant more to me as friend and mentor then I could ever repay. (He was also a friend of Ourlads and we named him our coach of the year in 2004). I can’t exactly remember when I first met Jim Johnson. He was a High School teammate of one of my High School Coaches, Gene Mitz and he coached at colleges that recruited High Schools I coached at. I also spent a year at his alma mater Proviso East with his high school coach Andy Puplis. He was one of the top athletes to come out of Proviso and the coaches that had him still talked about him the year I spent there. We are talking about an impressive group of athletes including Ray Nitschke, Doc Rivers, and Ed O’Bradovich to name a few. I really got to know Jim well when he was an assistant with the St. Louis football Cardinals in 1986-87. I was a new college defensive coordinator and I mentioned to a mutual friend, Marv Braden some issues I was having adjusting from High School. Marv was also an assistant with the Cardinals and he invited me down to St. Louis to spend some time with Jim. He said “this is truly a great coach and you can learn a lot from him”. Was he ever right. Jim and I hit it off right away as we had several mutual friends and shared other interests. Jim was as open and down to earth as they come and no question was a dumb one. He patiently taught me technique and scheme to help with our system. I spent the next 23 years watching Jim coach at games, visiting him at training camp and OTAs in Arizona, Indianapolis and Philadelphia, the combine, Senior Bowl, and his home in Indianapolis. His wife Vicky was a marvelous host. When I began my relationship with Ourlads in the early 90s Jim picked my brain about players and used our data base evaluations to help with his. I began evaluating players for Jim as he would send me tape and later DVDs. He would call a day or so later and we would compare notes. The tapes helped me immensely as a coach and Jim got my evaluations. Jim went from Arizona to Indianapolis to Seattle before arriving in Philly in 1999. I spent a lot of time with him at Indy making the trip to his office, games and home from Chicago. It was tough to see him leave but we stayed in touch on the phone and I continued to evaluate players for him. When he went to Philly he worked with Dan Shonka the current GM of Ourlads who was an Eagle Scout. Dan and I talked a lot about what Jim could bring to Philly and Dan talked to Jim about the merits of the Eagle situation. Jim was looking at two other jobs but decided on the Eagles. I went to Lehigh for that first training camp at Jim and Dan’s request and worked with some of the Eagles scouts including Dan going over how players might fit into Jim’s scheme. One of the things that stood out about Jim as a coach was his ability to motivate players and teach them concepts that made sense. He was one of the first coaches I heard explain the pros and cons of a concept so it was completely understandable. He could make complicated schemes simple. He was a master teacher of the game. I can’t tell you how many times over the years a visiting coach and I would be standing on the sidelines and I would hear a comment about what a good coach Jim is. This was before he got all the notoriety. He was an outstanding motivator as well. At times Jim didn’t have to say anything, a certain look from Jim said it all. He would get on a player when he needed it and give out praise at the right time. Nothing he accomplished surprised me. He was special as a coach, one of the few that really could make a difference. In later years when Jim and I got together the subject turned to all kinds of topics as he had a wide variety of interest but his favorite was his family. Jim loved his grandchildren and he would tell me stories about family gatherings playing with his grand kids and how much they loved sports. He told me how a kindergarten teacher got a scoop on the Eagles from one of his grandsons who shocked her with his knowledge of football. I took every opportunity to spend time with him but it got tougher as our schedules got more hectic. We began a tradition of meeting in Indy during combine time and going out to dinner one night and Steak and Shake the next day. This year was the first time in many years that we didn’t get together. Jim was a great friend as anyone who knew him well could attest. He cared deeply about his friends. After one of the first of many times he helped me with a football issue I said thanks and asked what I could do for him he said, “Go back to Chicago and take Joe Roman out to dinner” Joe was one of Jim’s closest Chicago friends. (As I write this my cell phone has been ringing off the hook from mutual friends). We always made sure Jim got an Ourlads book and one of the Ourlads guys Carmen Piccone also did Pro Personnel work for the Eagles. This past draft Jim wasn’t as involved due to his illness but he called me and asked “where’s my catalog?” as he called it. Jim did not want any sympathy and when we talked the subjects were the same. I admired his courage, especially with coaching the mini-camp. These last few months have been hard as we prayed and hoped for the best. I have so many great memories of Jim. I loved to hear his stories of coaching at Notre Dame with Dan Devine and Gerry Faust, at Indiana with Lee Corso, and the USFL with Woody Widenhofer and Lindy Infante. Jim worked with some of the great coaches of the game. That list also includes Gene Stallings, Joe Bugel, Fritz Shurmer, Vince Tobin and Ted Marchibroda. The last ten years he spent with Andy Reid who will go down as one of the great ones. He loved working for Andy Reid and the Eagles. Jim also appreciated the assistant coaches he worked with and at times worried he was too hard on them. He wanted to help them in any way and was very proud of them. He has a tree of coaches in Philly that has gone on and done some great things and will do more in the future. He also had a group in Indianapolis that has done well. That list includes, Les Frazier, Ron Rivera, Steve Spagnulo, and John Harbaugh. Add Sean McDermott to that list. From Indy Chuck Bresnahan and Greg Blache have had success as coordinators. The 26 pro bowl players in Philly are well documented. He also had and influence on some great players in Arizona and Indy. He was Aeneas Williams first secondary coach in Arizona. Jim also appreciated the scouts as he always gave credit to guys like Bill Tobin, Dan Shonka, Jake Hallum, Carmen Piccone and Bobby DePaul to name a few. There are so many of us out there that have lost a great friend. His family has lost a great family man and football has lost one of its greatest coaches. If they start putting assistant coaches in the Hall of Fame Jim should head the list. 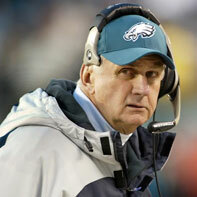 As Andy Reid said “You can’t replace Jim Johnson”. Football coach is only a small part of that. We will all miss Jim. Rest in peace my friend, and God bless.